Raisins are a natural sweet treat, but may not be enjoyed if you have an allergic reaction after consuming the dried fruit. Raisins are made from dried grapes and are not considered a common food allergen, although any food can trigger an allergic reaction. It's possible that if you have an allergy to mold, you may develop an allergic reaction after eating raisins, according to the Cleveland Clinic. Make an appointment with an allergist to determine the cause of your symptoms. 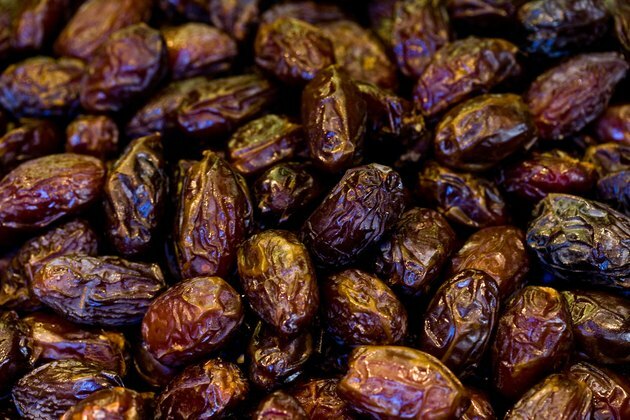 A raisin allergy occurs when, instead of your immune system identifying the proteins in the raisin as safe, it mistakenly reacts as if they're harmful. The immune system's function is to keep the body safe from infectious organisms such as viruses, bacteria and toxins. When your immune system mistakes raisin proteins as dangerous, disease-fighting agents called antibodies are created to destroy the substance. Immunoglobulin E are the specific antibodies produced by the body to fight off a food allergen. These antibodies cause a chemical chain reaction throughout the body that causes most allergy symptoms. Symptoms from a raisin allergy are the result of increased histamine in soft tissues. The IgE antibodies communicate with white blood cells, located in soft tissue, which produce histamine to protect the body. Histamine causes blood vessels to dilate, your lungs to constrict and increased mucus production. These changes in the body can cause nasal congestion, a runny nose, watery eyes, trouble breathing, wheezing, coughing, chest tightness, diarrhea, vomiting, nausea, stomach pain, skin rashes, eczema, hives, a change in heart rate and lightheadedness. Mold allergies are common but are typically categorized with hay fever or an airborne allergy. Mold is present in various places and can be found on some dried fruit, including raisins. If you have a known mold allergy, talk with your doctor about implementing an elimination food diet. If you're allergic to mold, you may be able to eat grapes but not raisins, because of the possible presence of mold in raisins. Once the exact cause of the allergy is identified, your doctor will recommend avoiding all known allergens. If you accidentally ingest raisins or mold spores, you may be able to take an over-the-counter antihistamine to reduce your symptoms. Other medications may include pain relievers, decongestants and topical steroid creams. Do not use any medications without first consulting with your doctor. Can Food Allergies Make Your Hand Itch & Turn Red?